Here we’re dealing with Bible versions, so we’re invading perhaps Satan’s primary domain. Few things have the potential to do more spiritual damage than a fake Bible. You can imagine if a Bible version is fake it could have a false plan of salvation, it could have a false depiction of Jesus, it could teach false doctrines, if not totally, at least it could dilute the truth. We’re just going to look at the various versions in passages relevant to creation issues, but that will be enough to convict EVERY major modern version of heresy and blasphemy. If you don’t believe that now, you’ll see incontrovertible proof in the links below. 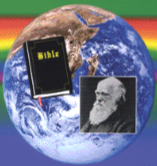 Creationists are noted for taking the Bible literally – and that’s a good quality for a Bible believer to have. We believe in a literal creation, we believe the days are literal, the garden of Eden is literal, Adam and Eve were literal, the fruit and the fall were literal – and the serpent was literal. But I marvel that many creationists, who rely on the specific, particular, literal wording of scripture for their beliefs, are so often willing to accept modern versions that use different words, and thereby say different things. Once a literal creationist leaves an absolute standard, he has given the evolutionist grounds to do the same thing. Most heretical groups have favorite versions that can be spun their way. Liberals like the RSV (now ESV). Feminists like the TNIV gender neutral version. JWs and the RCC have their own versions. Sodomites prefer the NIV. We’re going to see which versions the evolutionists would like – and a creationist has no right to rebuke an evolutionist for appealing to modern versions if the creationist is doing the same thing himself. The evolutionist might resort to more liberal versions, but the principle has already been violated. Frankly, I’m surprised that more evolutionists don’t take advantage of this. Most of them miss the golden opportunity to beat creationists over the head with their own Bibles. I’ve often considered giving this information to evolutionists so they will force creationists to run to the KJB for cover. Rom 2:20-22 An instructor of the foolish, a teacher of babes, which hast the form of knowledge and of the truth in the law. 21 Thou therefore which teachest another, teachest thou not thyself? thou that preachest a man should not steal, dost thou steal? 22 Thou that sayest a man should not commit adultery, dost thou commit adultery? thou that abhorrest idols, dost thou commit sacrilege? This passage is pointing out people who say something is wrong for others while permitting it for themselves. The application for our situation could be: “Thou that chasteneth another for using liberal versions, dost thou use modern versions?” The Bible word for such a person is HYPOCRITE. We’re not going to even worry about the more far-out versions, like the Queen James Version, Klingon Version, or the Black Ebonics Bible, we’re going to look at the most popular modern versions. Their common argument is that the changes don’t affect any important doctrine. We shall see. The verses will be presented for all to look at. This presentation has enough humor to keep your attention, enough sarcasm to keep my attention, and enough facts to prove the point to any honest observer.